The sailing and va’a venue for the Pacific Games was changed to Mulifanua where the Sheraton/Aggie Grey’s resort is because of wreckage left submerged or partly submerged in Vaiusu Bay, which would have otherwise been an “ideal area” to host the events. Samoa Sailing Association sports competition manager Paul Davies said it was also hoped sailing could take place opposite the Yacht Club at Mulinu’u, however that area was considered too small. He said knowing the limitations of these two sites, the Association decided a more informed decision would be better made by the World Sailing appointed Sailing Technical Officer for the Games, David Brookes, who came to Samoa the weekend before last. 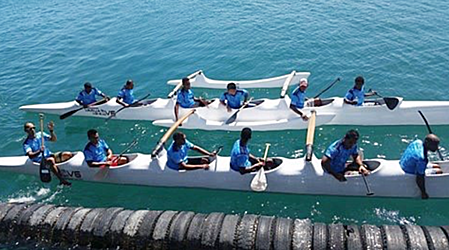 At the last Samoan-hosted Pacific Games in 2007, the sailing took place at Mulifanua, which Davies said made it difficult for spectators to travel to see the sailing. He said this is why the Association favoured Mulinu’u or Vaiusu Bay. He said requests were made to the Pacific Games Organising Committee for the many submerged or partly submerged bits of machinery which have been left in Vaiusu Bay after sand dredging to be removed, which would also make it safer for all craft using the bay. “Unfortunately we were informed that time and finances did not allow for such an expensive operation. Davies said the Samoa Sailing Association is of course disappointed not to have sailing at Mulinu’u Peninsula where it would achieve higher public and spectator involvement, but fully understand that the most crucial thing is to deliver a world class competition held at the most appropriate sailing venue. He said the prospect of the Pacific Games being an Olympic qualifier would be a tremendous achievement for Oceania Sailing.